Three friends discover their new flatmate dead but loaded with cash. Alex Law: Cameron, what a surprise! Q: upon hugo's death, why didn't the flatmates simply phone the police and hide the money. that way the police wouldn't suspect foul play and wouldn't have any knowledge about the large amount of money either. A great modern thriller containing all the necessary ingredients of a decent suspense story: constantly growing tension, sly humor, and genuinely surprising plot twists. It's kind of like a 90s version of a Hitchcock flick (think "Rope"), and like somebody here wrote, once you start watching it you can't stop. The plot is deliciously wicked. Just how far are you going to go for money? Will you kill for it? Are you willing to share it? Will you give up your best friends for it? How insane will a large amount of cash drive you? 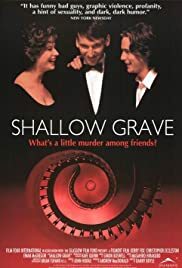 And in the end, and this is the most important question "Shallow Grave" rises, will it make you happy? If there was any more violence in this movie it would turn disgusting, but Danny Boyle knows how to measure it just right. Though he doesn't quite reach the virtuosity of "Trainspotting" here, his trademarks are all present: the fast pace, the urban background beats, the enthralling camera angles and so forth. The three leads are all great, but there's no question about who the movie belongs to: Ewan McGregor is energetic, powerful and photogenic in his portrayal of a young journalist. No wonder he became such a star. 53 of 63 people found this review helpful. Was this review helpful to you?